Vitamin D is necessary for your body to absorb calcium. Many people get adequate amounts of vitamin D from sunlight, but this may not be possible if you live at high latitudes, if you’re housebound, or if you regularly use sunscreen or you avoid the sun entirely because of the risk of skin cancer. There is scientific debate as to the optimal daily dose of vitamin D. A good starting point for adults is 1000 international units (IU) per day, through food or supplements. If your blood levels of vitamin D are low, higher does may be required. 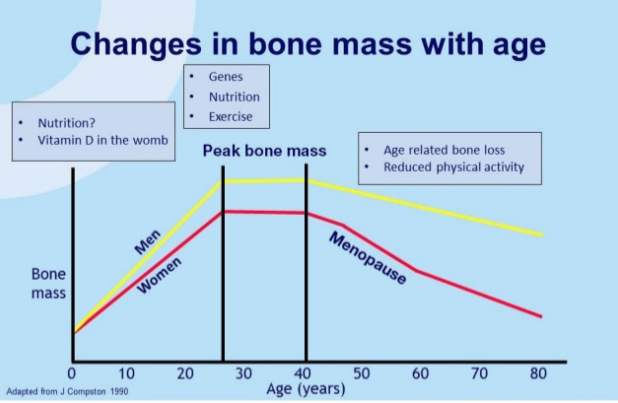 Exercise can help you build strong bones and slow bone loss. Exercise will benefit your bones no matter when you start, but you will gain the most benefits if you start exercising regularly when you’re young and continue to exercise throughout your life. Combine strength training exercises with weight-bearing exercises. Strength training helps strengthen muscles and bones in your arms and upper spine, and weight-bearing exercises — such as walking, jogging, running etc. Swimming, cycling and exercising on machines such as elliptical trainers can give a good cardiovascular workout, but because such exercises are low impact, they’re not as helpful for improving bone health as weight-bearing exercises are. Our skeletal system is in a constant state of change and number of interventions can adversely affect or improve bone health and prevent fractures.